Israel Perez, a Ph.D. student in the Department of Materials Science and Engineering advised by Maryland NanoCenter Director Gary Rubloff (MSE/ECE/ISR), conducts research into how nanoporous anodic aluminum oxide can be used as a platform for energy storage. He has created tiny energy-storing devices called Metal-Insulator-Metal (MIM) nanocapacitors. The innovation involves the use of a material called nanoporous anodic aluminum oxide (AAO) to boost energy density. This has resulted in a tenfold gain in the amount of energy that can be stored, which allows these nanocapacitors to compete with electrochemical supercapacitors as viable energy storage devices. Near-term applications include working in parallel with conventional energy storage devices in cell phones and laptops and eventually even becoming the sole energy source in such devices. Nanoporous AAO has vast implications as a tool for nanoscience research and as a structure in which devices can be fabricated because of its regular and ordered nanopores. Nanoporous AAO membranes are formed by simply anodizing highly pure aluminum in an electrolytic solution. During the anodization process the nanopores naturally self-organize into arrays of hexagonal ordering. This processing leads to a membrane which contains straight and cylindrical pores (diameter ~ 50-80nm, depth 0.5-30µm) aligned normal to the substrate and of high aspect ratio (1000:1). 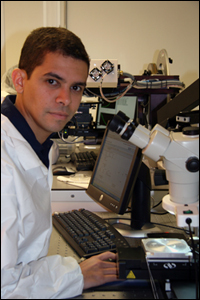 Perez's research involves synthesizing nanoporous AAO templates and studying the characteristic shapes and materials composition of the structures to better understand the implications for energy devices built on their surfaces. The Metal-Insulator-Metal (MIM) nanocapacitors are an example of an energy device created using these templates. Using atomic layer deposition (ALD), a thin-film deposition method able to deposit conformal films in high aspect ratio nanostructures, a three-layer MIM structure (TiN-Al2O3-TiN) was deposited into the nanopores of AAO templates. When he tested this structure, Perez found that using nanoporous AAO boosted the energy density of this simple MIM structure. It surpassed the capacitance density values reported for similar devices in the literature by 10X. The high power density characteristic of MIM electrostatic capacitors, coupled with this large improvement in energy density, makes our MIM nanocapacitors capable of competing with electrochemical supercapacitors as a viable energy storage device.